This single-phase two-pole twist-lock 120 volts 30 amps receptacle is common for small and mid-sized generators. If you load it to 80% of its rated current as recommended, you can draw up to 120x30x0.8= 2,880 volt-amp. 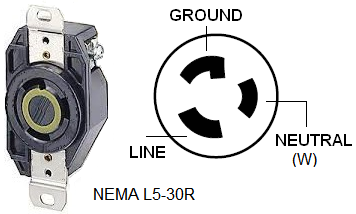 The mating 3-prong plug part number is NEMA L5-30P. It has to be used with UL-listed cord containing three #10 AWG wires. Connect red or black lead to Line, white to Neutral, green to Ground (see the pinout diagram above for the terminal designations).